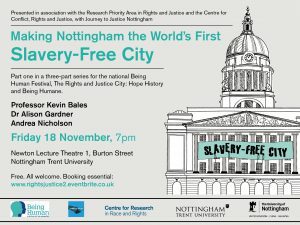 University of Nottingham > Blogs > A View from the Arts > Being Human Festival > Can we make Nottingham a slavery-free city? Can we make Nottingham a slavery-free city? Abolishing modern slavery is at the centre of Theresa May’s personal policy agenda. National Government has mainly focussed on the implications for foreign policy, trade and development, and police enforcement, as well as responding to reports from the UK’s first independent anti-slavery commissioner, Kevin Hyland. However slavery in the UK is principally encountered and addressed at a local level, and relatively little attention to date has been given to the community-based opportunities to prevent slavery and recognise – and assist – the ‘slave next door’. Our new initiative on ‘slavery free communities’ aims to close this gap. The project forms part of the ‘Freedom Blueprint’ project, funded through the University of Nottingham’s Rights and Justice Research Priority Area. It starts from the principle that local civic leadership can play a critical role in addressing slavery including raising public awareness, providing training for frontline staff, promoting slavery-free procurement, and co-ordinating voluntary-sector support services. Communities can also provide vital resources and intelligence in helping to prevent and uncover slavery, and to support local victims. 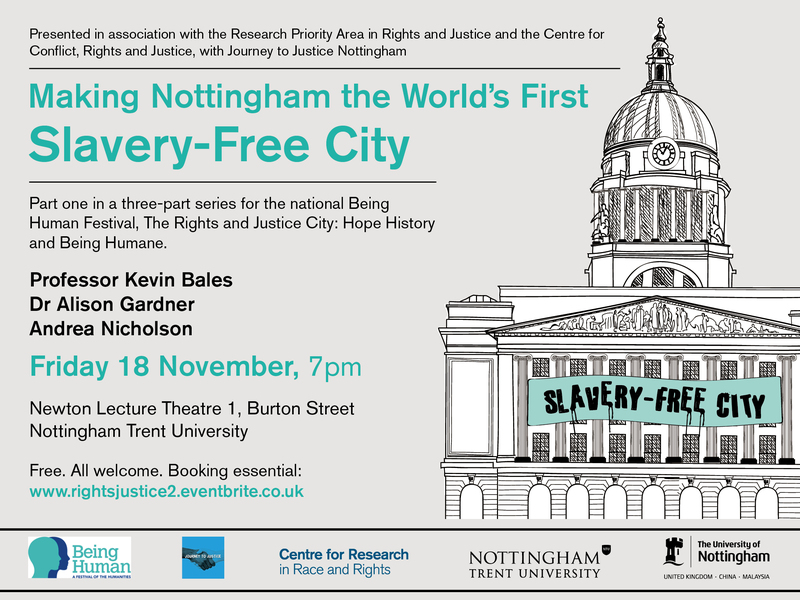 On Friday November 18th, I and Professor Kevin Bales will lead a public discussion at the ‘Being Human’ festival on ‘making Nottingham slavery-free’, part of a three-part series on the ‘Rights and Justice City’. The debate will focus on the potential for locally-based action in Nottingham and Nottinghamshire to address modern slavery. Police and Crime Commissioner Paddy Tipping will also be attending, reflecting on his recently-published Modern Slavery Profile and action-plan. The main aim of the evening will be to initiate an interactive and ongoing dialogue between academics, policymakers and the public, to understand how slavery is currently experienced in and around Nottingham, and to seek new community-based solutions to addressing this global challenge. Come and join us, and help us to work towards proclaiming Nottingham slavery-free! Alison Gardner is a post-doctoral research fellow, leading the ‘slavery-free communities’ initiative for the Rights and Justice RPA at the University of Nottingham. She has a career background and ongoing research interests in local governance and public policy, and uses action research to work alongside practitioners and communities in creating shared knowledge and innovation. The James Plays – Scotland’s answer to Game of Thrones? Keep up to date with the latest research and activities within the Arts and Humanities.